Our favorite Nuclear Man graced the cover of The Comic Reader fanzine in April 1978! To be honest, I’d never heard of this fanzine until I stumbled across this cover. I love this shot of Firestorm blasting a miniaturized version of Steel, the Indestructible Man! The art was done by The Comic Reader Executive Editor, Mike Tiefenbacher. Some fast research has taught me this fanzine was published monthly from 1971 to 1983 by Street Enterprises. It was apparently started by Paul Kupperberg and Paul Levitz, both would later go on to be mainstays at DC Comics. Each issue of The Comic Reader published what comics were coming out that month (mainly Marvel and DC), and a synopsis of the story. It was like Diamond’s Previews or Wizard Magazine before either existed. This particular issue was 32 pages in black and white, and measured 5.5″ x 8.5″. The Comic Reader #159 (Aug. 1978) on The Idol-Head of Diabolu, a Martian Manhunter blog – just four months after the issue above, they were reporting the cancellation of 23 titles (including Firestorm and Steel). To see nearly all the covers to The Comic Reader, click here to visit Cover Browser. I love discovering obscure items from yesteryear, especially ones that are unfamiliar to me! Hooray for the wacky bronze age! Posted in: Comic books, Firestorm #01: Original (Ronnie/Martin), Firestorm comic vol. I. BEST comic fanzine EVER! 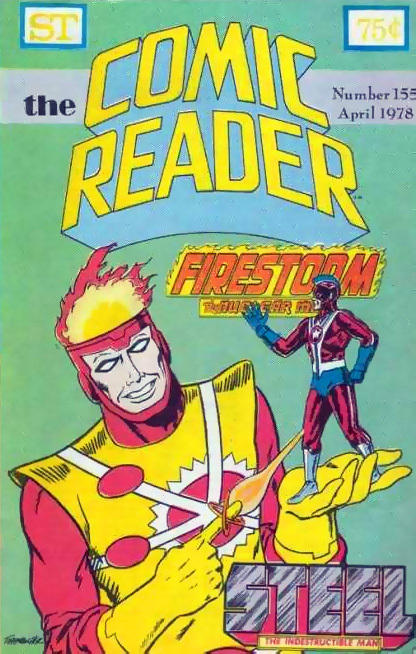 I stumbled upon it at a comic shop and went nuts at seeing covers early and reading news (it’s how I learned of The DC Implosion), I still have a huge stack of the little TV Guide sized issues including the Firestorm cover shown here! It’s always interesting to me to see what people did before the internet….